Driving along the dusty gravel roads of Namibia is like driving through a David Attenborough documentary. I can’t quite find the words to do justice to the stunning colours of the sands, the vast openness interspersed with mountains, the phenomenal dry river landforms and barrenness of the ‘lunar landscape’; everything stretches as far as the eye can see yet every hour or so driving through Namib-Naukluft National Park you come across another breathtaking landscape. And to top it off there are mountain zebras, giraffes and oryx to spot along the way. 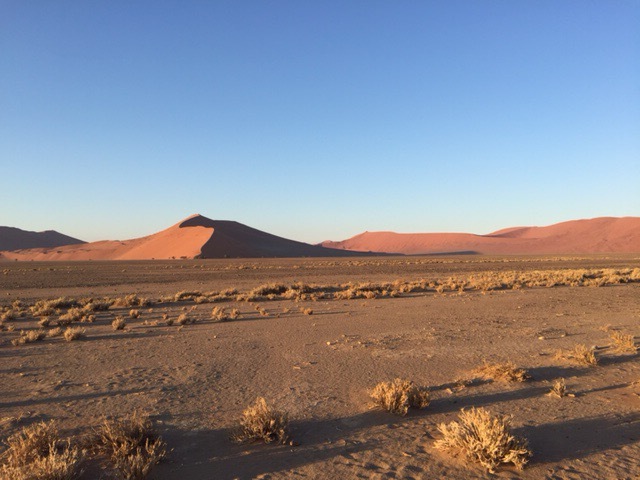 My journey through the desert started driving from Windhoek across the central plateau towards Sossusvlei. The impressive mountains with tarmac roads make way to savannah and the start of many miles of gravel roads. Stopping for a couple of photos stops as the vegetation became sparser and the inselbergs (isolated hills and mountains remaining after everything else has been eroded) stand out across the plains, the bus rattled its way to Namib Desert Lodge near Soltaire. The lodge sits nestled at the foot of the fossilised dunes of the Namib desert. The deep red from the iron oxide makes a striking statement as the ‘cliffs’ rise up over the plains; and it’s even more impressive to think they’ve stood there for over 20 million years! Driving up on to the dunes, you realise there is much more vegetation than you’d expect for an area that has seen next to no rain since 2011. Tough, short grasses in clumps cover the fossilised dunes, gaining their water from the fog that can stretch inland each morning as it condenses on the plants and in encouraged to run down the stems to the ground by the white ‘fluff’ covering them. Saying that, the dunes also evidence the extent of the recent droughts as areas once used for housing livestock by local farmers have been abandoned. As the sun set over the dunes, the colours of the land and the sky become both more varied and intense. The redness of the sand deepens while the yellow grasses appear to become greener as the light fades. The sky erupts in hues of blue, purple, orange and red as the sun drops behind the dunes and the nearby mountains and trees become black silhouettes against the multicoloured sky. The perfect view to appreciate with a sundowner G&T! Driving towards the dunes of Sossusvlei before sun rise the following morning gave the opportunity to see the morning fog in action. Oryx, springbok and ostrich come out as the sun starts to rise to eat and drink from the condensing fog on the plants. Entering the Serriem gate just before sun rise we stopped to watch the sun appear over the mountains; the light on the dunes is magical as the bright orangy-red comes alive with the rising sun. Passing the area’s most photographed dune, dune 45, with a stream of people already half way up, we made our way through the dunes to ‘Big daddy’ dune (the tallest dune at about 325m) and Dead Vlei (switching to 4×4 vehicles for the last 5km over the sand). Walking though the dunes as the sun continued to rise, you can see why they have been internationally recognised as a UNESCORTED World Heritage Site. The dunes appear to darken as the day continues to becoming almost maroon. Amazing and magical doesn’t even come close to describing the view across the dunes as you climb up a dune ridge. Behind ‘Big Daddy’ is Dead Vlei, an eerily beautiful dip between the dunes. The white clay pan floor, almost appearing slightly green, provide a stark contrast to the red dunes surrounding it and the bright blue, cloudless sky. Skeletal tree trunks, scorched by the sun, protruding from the clay give the area that eerie feeling when you find out they’ve been there, like that, for an estimated 900 years. Returning to the vehicles as the heat of the sun started to kick in about 9am, you really got a sense of just how hot this place would be by the time the sun was high in the sky, not to mention what it would be like in summer! Driving back through the desert we stopped at Serrium Canyon, a narrow, shallow gorge formed 10-20 million years ago as the Tsauchab River carved its way through the sandstone and pebble. Walking down into the Canyon you can wander along its sandy floor and imagine the torrents of water flowing through it that created such a landscape (helpful marked arrows showing the direction of water flow make this a little easier). Driving from Solitaire to Swakopmund the next day takes you through an ever changing landscape. The fossilised dunes make way for grasslands (with an early morning sighting of a giraffes and mountain zebra) then onto the gravels plains via the Kuiseb and Gaub Passes and the Tropic of Capricorn. The passes, sometimes called canyons, are large expanses of dry river valleys that are spectacular to drive through as a Geographer with an array of preserved river channel features you can’t usually see because of the water in a river. 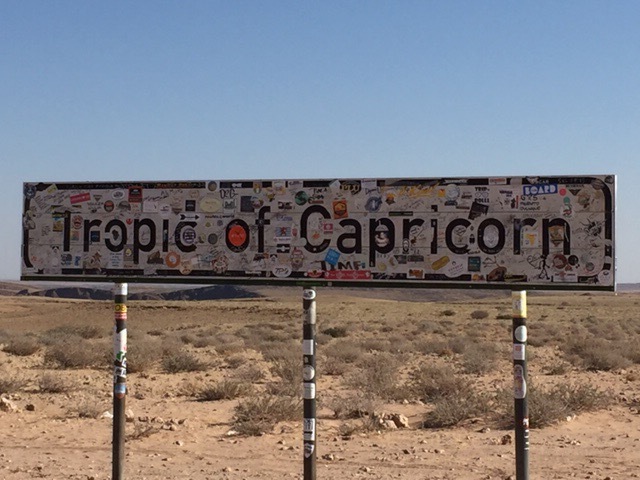 An obvious highlight of the drive through the desert is a photo stop at the Tropic of Capricorn. The gravel plains are home to Namibia’s most famous desert plant, the welwitschia mirabilis. Nicknamed the ‘living fossil’ these plants can live over 1500 years and consist of only two leaves that shrivel and shred over time. Adapted to surviving years with no water they are endemic to this arid region but they do need water for seeds to germinate so the most recent known ‘baby’ welwitschia mirabilis is 50-69 years old as there has not been enough rainfall at any point recently for germination to occur. The last desert landscape before arriving in Swakopmund is the famous moonscape from Mad Max: Fury Road. The vast area of undulating granite mounds was created 460 million years ago and has been shaped by the changing course of the Swakop River and wind erosion to give its iconic ‘lunar’ appearance. It’s a bit like walking in a Star Wars movie! Driving through the Namib desert has been one awe-inspiring landscape after another. The next section of my travels is going to take a slightly different turn as I spend a bit of time in Swakopmund and Damaraland finding out more about the people and human geography of Namibia. 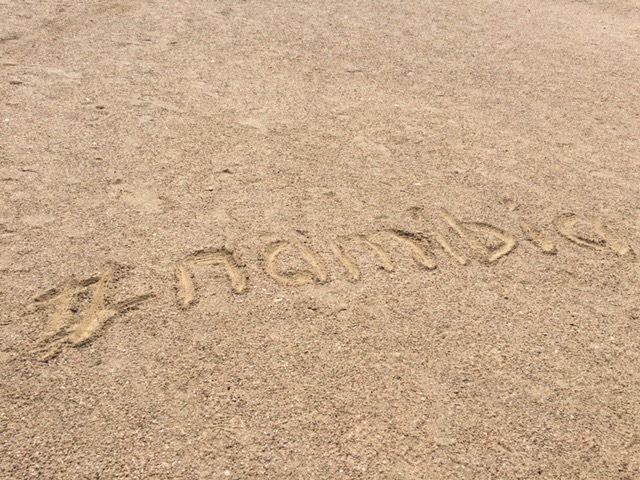 Part 2 of #namibia about its people and human geography to follow as my adventure continues. Previous Are you prepared to question everything?